Hollywood has issues. The last year has made that much more clear than ever before. Weinstein and the actions of other men have highlighted serious cultural issues that stretch across the industry, its money, the media, and the community itself. The 90th Oscars show was all about reminding people of the power and heritage of film itself, and highlighting the many classic moments of cinema over the years. The film industry didn’t have much other choice, really; film is such a vital art form, and people need to be reminded of that fact, but the industry itself needs to drop its incredible hubris and do some real soul searching. The Oscars themselves, as an event, have issues too. Over the last couple of years the Oscars have become better at highlighting diversity in the industry, and on a fundamental level it’s important to highlight achievements across film that extend beyond the actors, who are usually lauded as the heart and soul of a film. That's the good that the show does. But the continued existence of a “best foreign film” category continues to be frustrating. It represents a core belief that unless a film is made in English, in Hollywood, it can’t possibly be as “good” as the films made in Hollywood. It also shows that the voting process for the awards is based on popularity and not some kind of pursuit to recognise quality. It would strike me as being better idea if the Academy was able to adjust its voting process to include foreign films in the “main” categories, and then make sure that the judging system is better balanced, because every year films from foreign creators are every bit as worthy in terms of writing, cinematography, direction, costuming, makeup and so on, and go without as the English films that exclusively occupy those award categories. For the most part, I think the Academy Awards is a flawed, but noble idea. And, critically, every year that I watch the Oscars, I am reminded of just how much more mature the film industry, both in terms of presentation and artistry, is over gaming. I’m also concerned that the voice in the games industry are generally quite muted in looking to film, and other mature art forms, as inspiration behind efforts to mature of the games industry itself. Certainly this industry doesn't want to adopt the cultural issues of the film industry, but it could learn some things about creativity by studying film more closely. Because Hollywood was so invested in reflecting on the history and heritage of cinema this year, a big part of this year's Oscars show was looking at footage, key scenes, and moments of cinema. Something that is so noticeable with cinema when compared to video games (take, for example, E3, as the “biggest” games event of the year), is how different the two mediums are, despite sharing so many similarities, in depicting conflict, and particularly, violence. Conflict is necessary to storytelling. It’s an essential component that any creative arts student will spend a lot of time researching and understanding, whether they’re looking at the written word, or a visual medium like film. But – and this important – conflict doesn’t necessarily mean physical violence. Conflict is far broader than that. Conflict can be the sexual tension between two people in a romantic comedy (yes, there is conflict in comedy). Conflict can be a journalist’s pursuit of the truth in a story – it’s a conflict of ideas and the journalist’s research skills, even if the film doesn’t involve a single thrown punch or gun. Conflict could be the heated debate between two lawyers in a courtroom. Conflict can be a person looking to find a job. It could be an exploration of the impact that society, as it’s set up, has on a person. It can be a million other things. There’s such a broad range of topics that conflict can encompass. Sure, there’s going to be physical conflict in a film about war (for example), that’s just one subset of the films that we see. Swing over to video games, and it’s just so obvious that game developers really struggle to depict any form of conflict which isn’t manifested physically. For the most part, when a video game is “non-violent,” it’s a game that tries to strip the conflict back completely, and you end up with a highly experimental or abstract game (usually some form of puzzler), to the point where storytelling itself is no longer a concern. The moment a developer decides to tell a more conventional narrative, the need to have a conflict will almost always manifest as some kind of violence into the game. Yes there’s the rare exception – Yonder has an evil miasma that you need to defeat (conflict) and do so by helping townsfolk collect and build things (non-violent). Phoenix Wright does the courtroom drama and conflict thing without adding guns to the equation. I’m also not suggesting that all forms of violence are gory, visceral slaughter simulations. No one thinks about Dynasty Warriors being a “violent game,” but yeah, it’s incredibly violent. There's no blood, but you are killing thousands of soldiers by the hour. Even something as childish and innocent as Moss has combat. The point is that cartoonish or not, almost every game that has a developed enough narrative to have a conflict is probably going to be saddled with some kind of violence to resolve that conflict. Furthermore, the other great difference between cinema and games when it comes to conflict is the way that it depicts physical violence, particularly through promotional material. Even with the most brutally violent of war films - stuff like Dunkirk - the film industry tries to cut through the conflict to frame and contextualise it. To show that it’s a story about people, of humanity, and the impact of violence on that. And that’s important, because if we’re going to approach violence from an adequately critical perspective, we need to recognise violence isn’t a pleasant thing, and it’s the impact of that violence where the thematic crux of a violence story is. Games swing the other way, by and large. 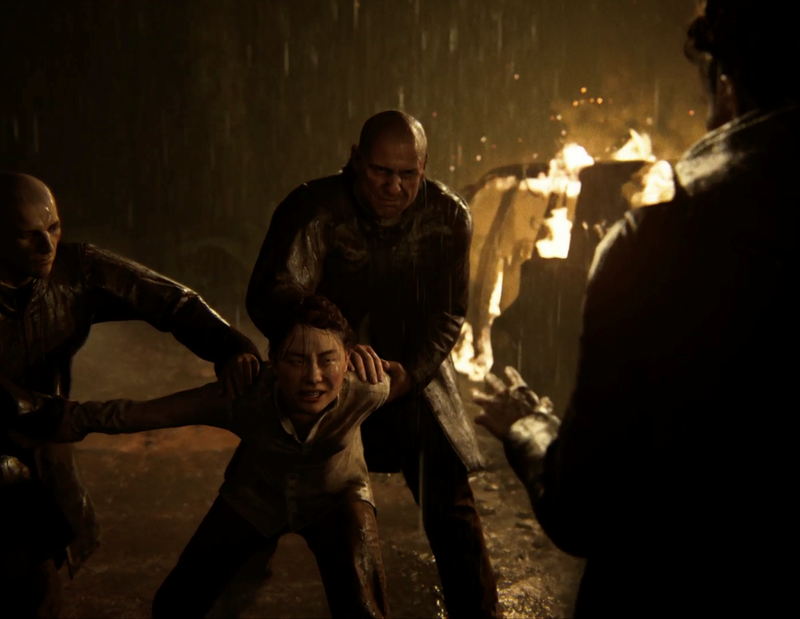 Whoever cuts trailers and “gameplay footage” of video games for these shows is far more interested in emphasising the extremity of the violence, and seem to take deliberate pains to remove it from a context so that people can enjoy it. Most of the time the developers are so keen on keeping their stories mysterious that they deliberately obscure any other story element to the point where the only story is the violence. Developers go out of the way to show the increasingly creative and visceral way that your avatar in these games can kill their opponents. I’ll never forget the way that a Bethesda representative spoke with such excitement about the GORE in Doom a few years ago… or the way the audience cheered. It’s become emblematic of what this industry really does celebrate to me. Why is this? Why must conflict be resolved through one violent means or another in our games? Is it that our industry’s storytelling is that weak that the only way we can tell a story is to literalise it as something to beat up? And alternatively are we as players that uninterested in every other element of a game to the point that a trailer that doesn’t make violence the focus becomes dull to us? Is it because game designers tend to be far more “systems” orientated? Is the problem the focus on STEM-based skills in games, so that the creative layer of game development becomes focused on bullet physics, statistics that manage experience point systems, and frame rates and hit boxes for online multiplayer? It it all far easier for these designers to visualise these things, and then have the producer hire a script writer to "fill in the blanks" and give the violence-focused systems a commercial delivery mechanism? You rarely hear filmmakers talk about their work as "content," but you certainly hear those in the games industry frame their work that way - the "artsy stuff" seems to be something to drive sales, rather than drive a message. The point is that certainly the creative process that goes into a game is very different to how someone would sit down to write out a film or novel, so there’s something in that perhaps explains why game developers struggle to break away from the fixation on violence. Or perhaps it’s the community itself. “Walking simulators” and visual novels often reference or depict violence, but that’s generally done with much the same purpose as cinema generally does it; it’s context and framing, not the point of the experience. Those games are often dismissed derisively for being “boring” or “not-games.” So perhaps there’s community pressure that continues to force developers to construct these violence-orientated systems and then focus on them in order to appease a consumer base. But the industry needs to draw inspiration from other art forms. It needs to get more filmmakers looking at it seriously. It needs to involve writers earlier on, and not just get them to write cut scenes between action sequences and astronomical body counts. The games industry needs to find other ways to depict conflict, and better understand the role that violence plays as a form of conflict, else it’s going to find itself in a looping, stagnant, creative rut. The games industry might be making more money than it ever has before, but as a creative medium, it’s doing very little to establish itself as the next place for great artistic ideas.